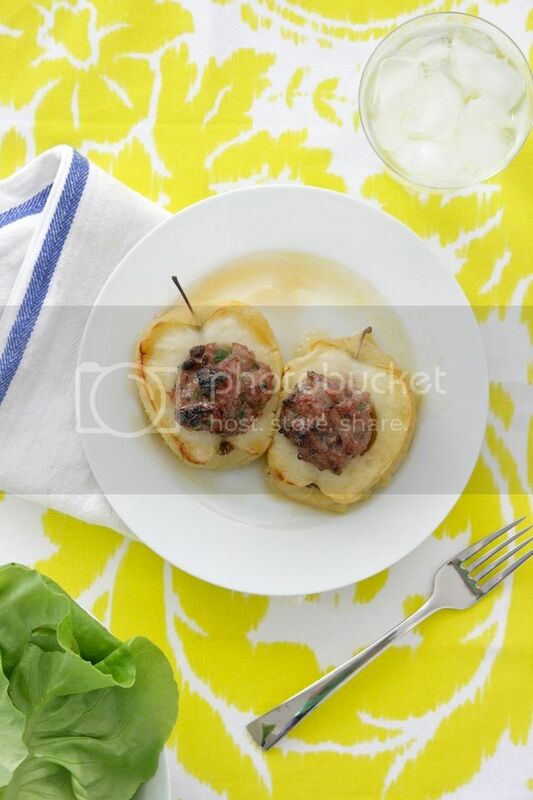 Simple Supper: Sausage-Stuffed Maple Apples—My Latest On Refinery29! / Hey, EEP! Simple Supper: Sausage-Stuffed Maple Apples—My Latest On Refinery29! Here's the latest recipe from my new 3-Ingredient Dinner recipe column on Refinery29! It's perfect for using up apples after an orchard adventure (or over zealous trip to the farmers' market, in my case). With just the staples in your pantry—salt, pepper and olive oil—plus a few simple ingredients, you can have this sweet-and-savory dinner on the table in fewer than 30 minutes. 1. Preheat the oven to 400˚. Brush a shallow baking dish with olive oil. 2. Cut the apples in half lengthwise and then cut a small slice off of the rounded side of the apple halves so they lay flat. Scoop out the tough centers using a melon baller or small spoon, creating a 1 1/2 to 2-inch diameter hole. Arrange apples, hole-side up, in the prepared baking dish. Sprinkle with 1/4 teaspoon salt. 3. Mix the sausage, maple syrup, 1/2 teaspoon salt and 1/4 teaspoon pepper in a bowl with your hands until combined. Divide sausage mixture among the apples, pressing gently to fill the holes. Drizzle the tops with olive oil and bake for 20 minutes, or until the sausage is fully cooked and the apples are soft. Serve with more maple syrup, for drizzling.